Governance, risk management, and compliance (GRC) technology can provide big benefits to your organization. What can you expect and where do you start? 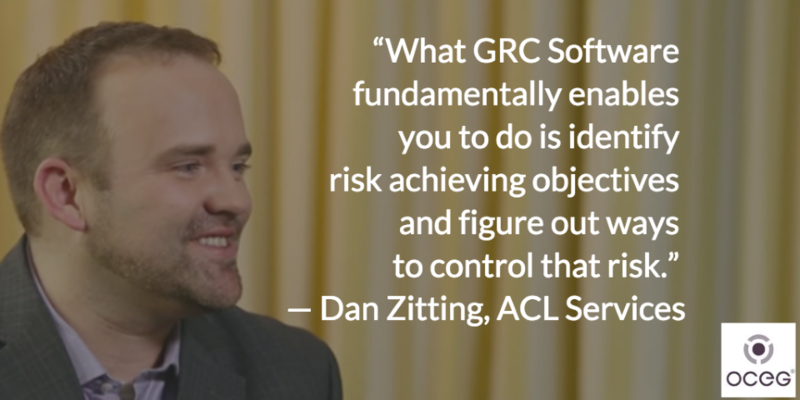 Dan Zitting shares his perspectives in the video interview “Applying Technology to GRC — The Big Picture.” As VP of Product Management and Design at ACL Services, Dan has many experiences to draw from. What is the purpose of GRC technology? Dan explains it allows organizations to understand, manage, and find risk. The right GRC technology empowers organizations to discover ways of turning risk into opportunities. A GRC solution should focus on the “risk achieving objectives” of the whole organization. What are the risks to those objectives? What controls need to be in place to measure those risks? How do you evaluate and assess those controls? How is each functional area affected? What data sources can you use to evaluate risks and controls in new ways? Stay informed and watch these 24 short videos. “Applying Technology to GRC — The Big Picture,” is part of OCEG’s Tech Talk Series. The online videos explore GRC technology through interview with solution experts. Visit the full series listing for more information.